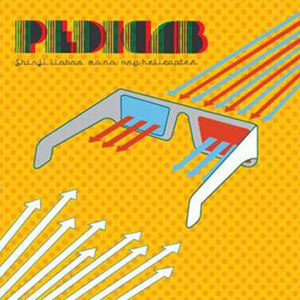 Pedicab releases 2nd album "Shinji Ilabas Mo Na Ang Helicopter"
The 12-track album of Pedicab, titled ShinjiIlabas Mo Na Ang Helicopter, will be launched by MCA Music on July 11(Friday) at Cubao X. If the title of this album seems like an inside joke to you,then you're right. In the July 2008 issue of FHM, Jason Caballanarrates how the title of the album was created. When the Pedicab band memberswere recording the carrier single "Ang Pusa Mo" in the Sound Creation Studio,they were fooling around when Diego Mapa suddenly came up with the lyrics"Shinji, ilabas mo na ang helicopter." Shinji refers to Shinji Tanaka, theengineer of Sound Creation Studio. Composed of Raimund Marasigan, Diego, Mike Dizon, Jason Caballa, and RA Rivera,Pedicab has returned to the recording scene with another hearty serving ofdance punk music. The band's second album is 12-track recording titled ShinjiIlabas Mo Na Ang Helicopter. Pedicab is known for its hit singles such as"Dizzy Boy" and "Dito Tayo sa Dilim," which were culled from their debut album TugishTakish released in 2005. Shinji is a cocktail of diverse ingredients, with elements such as rap,pop, and a more traditional rock sound added in for good measure. Tracks suchas the opener "FX," which chronicles the travails of a common rider of publictransport in rap, and the feel-good cut "Good to Go," which is a pop-rock songwith synthesizers, bring in foreign sounds to Pedicab's repertoire. Meanwhile,songs like "Simulan Mo Na" and carrier single "Ang Pusa Mo" are punk songs thatrecall the more familiar Pedicab sound. Raimund Marasigan's wit is in full effect, with theinnuendo-filled "Ang Pusa Mo" and the social commentary of Pa-Taste being thehighlight. The more "unique" tracks, such as "Good to Go" and "BreakingAway" are worth a spin as well. When you grab a copy of Shinji Ilabas Mo NaAng Helicopter, wait patiently for the hidden instrumental track at theend. Jam with the Chilitees, Taken by Cars and, of course,Pedicab when they launch the album Shinji Ilabas Mo Na Ang Helicopter.The event will take place on July 11 (Friday), 8 pm, at Pablo, Cubao X(formerly known as Marikina Shoe Expo).